Sarah Durston is Professor of Developmental Disorders of the Brain at University Medical Centre Utrecht. Former NIAS Fellow Sarah Durston together with Ton Baggerman published a book that examines the way we understand our current paradigms. During Durston's fellowship at NIAS, she worked on this book and on her related research project, which studied the role of consciousness in psychiatry research. 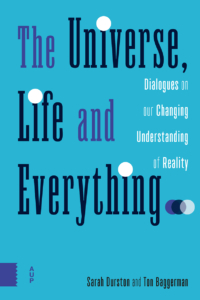 "The Universe, Life and Everything..." was published by the Amsterdam University Press in 2017. Read the full book (open access). You can also buy a copy at Athenaeum Booksellers, Amsterdam’s largest independent bookstore.